Toto had the Grand Sierra Resort audience on its feet early and often. They heard the drums echoing that night. “They” being a packed house of music lovers at Grand Sierra Resort and Casino in Reno. As for the drums, it was often difficult to tell, for you see, Toto had two drum sets onstage. The American rock band made a Reno stop during its “40 Trips Around the Sun” tour on Saturday, Aug. 4, in celebration of the group’s ongoing success since its creation in 1976. 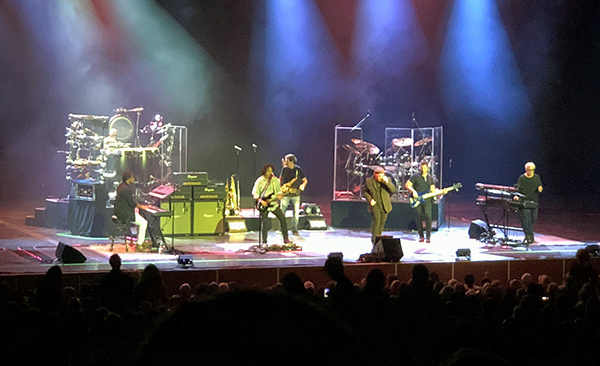 Toto performed for a sold-out showroom of fans of all ages, a testament to the band’s lasting power and broad and timeless appeal. While Toto’s lineup has changed over the years, a core of Steve Lukather (guitar, vocals), Steve Porcaro (keys, vocals), and Joseph Williams (vocals) had the crowd roaring and on its feet early and often. Touring members Lenny Castro (drums), Warren Ham (saxophone, flute, harmonica), Shannon Forest (drums), Shem von Schroek (bass) and Dominique Taplin (keys, vocals) rounded out the lineup in support of the wall-of-sound musical style for which Toto is well-known. The group performed beloved classics such as “Rosanna” and “Hold the Line” with gusto, the audience singing along lustily. As a (somewhat) casual Toto fan, I can attest to the thrill of seeing live renditions of songs that I have called up countless times on my sound system. Full disclosure, I can happily listen to “Rosanna” on repeat pretty much interminably. Toto also rolled out a broad array of lesser known tunes such as “Georgy Porgy” and “Make Believe.” An intimate interlude came when Lukather, Porcaro and Williams stepped forward as the rest of the band took a break, with the three playing short versions of a handful of songs with special meaning to them. Particularly moving was Porcaro’s “Human Nature,” a song he penned after his young daughter asked him why other children at school had been mean to her. The band even delivered a number of cover tunes, including a stirring version of “While My Guitar Gently Weeps” that Williams dedicated to the late George Harrison, with Lukather pulling out all the stops in shredding away on his electric guitar. For an encore, Toto served up “Hash Pipe” by Weezer (the two bands have traded cover songs recently), introduced by way of Williams noting that the members of Toto had been smoking hash long before the members of Weezer were ever born. As might be expected though, the palpable high point of the concert was the iconic song “Africa,” appearing that evening in an extended jam replete with soaring guitar and keyboard solos, a rhythmic breakdown, and a whole lot of audience sing-along. The 1982 hit single has achieved something of a cult status among many millennials, found everywhere from recent seasons of South Park to a wide application in internet humor, so it was no surprise to hear the entire theater joining in. I wasn’t able to discern how many of my companions were accurately singing “I bless the rains down in Africa” as opposed to the commonly misconstrued “I kiss the rains,” but hats off to everyone who had that down. After the show, a rush of exuberant fans thronged out the exits, perusing band merchandise, ordering fresh cocktails and just generally basking in the Toto afterglow. Mark McElwain traveled from Fresno with a group of friends to catch the band’s anniversary tour. Professional drummer Jon Gardner drove down from South Lake Tahoe to see the group’s handiwork. Gardner was also very clear as to why Toto’s musical appeal appears to have such a generation- spanning appeal. “I think ‘Africa’ is probably the biggest reason, for young people anyway,” he said. “You saw at the end people that weren’t even paying attention or weren’t there for the first half were singing at the top of their lungs by ‘Africa.’ It’s been in memes and all that stuff on the internet so it’s really popular with the young crowd.